Signing a contract obligates both parties to stand by their initial agreement. 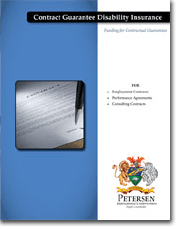 Unfortunately, unforeseen circumstances can inhibit people and companies from carrying out the terms of the contract. One party’s inability to fulfill the terms of the contract could mean the other party takes a huge financial loss. Traditional Contract Guarantee plans may not have high enough limits to fulfill your client’s needs; PIU’s Contract Guarantee Disability Insurance will cover your clients when other disability insurance agreements fall short. Whether this contract is between a company and employee, business partners, or divorced couples, almost all contractual relationships can be considered under this disability program. Make sure your clients are safe and their financial contracts are secure with PIU’s Contract Guarantee Disability Insurance. Ms. Q, age 55, an executive of a Fortune 500 company. She was hired at an annual salary of $600,000 plus bonus opportunities. A benefit package include group LTD insurance to cover 65% of her base salary. She believed her bonus income was covered by the LTD. The HR Department soon found out they had a major problem with the negotiated contract. The LTD plan had a $20,000 cap and would only cover base salary. Who would make up the $12,500 per month disability coverage needed to provide 65% of income? Petersen International Underwriters who have been providing adequate protection from the freezing winds of adversity for over a half century. Bringing to the purveyors of disability insurance significant and sufficient amounts of coverage.